The El Ghriba synagogue is located in the formerly Jewish village of Harah Sghira, also known as Harah Srira (the “small village”, in Arabic) (currently called Er-Riadh) on the Island of Djerba (also spelled Jerba), Tunisia. It is the most famous and venerated of the twenty synagogues and prayer houses that used to function in the three Jewish villages on Djerba at the height of the Jewish community in the early 1950’s. In Harah Srira alone there are five additional prayer houses, called yeshivot, however, the Torah scrolls have been kept exclusively in El Ghriba, following a decision taken by the local rabbis at the end of the 19th century in order to maintain the prominence of the El Ghriba synagogue. The entire community of Harah Srira meets in El Ghriba on Shabbat, the synagogue being kept in high regard by all the Jews of Djerba. The name “El Ghriba” means “the marvelous”, or “the strange”, in Arabic, and reflects the special status of the synagogue in the traditions of the Jews of Tunisia. 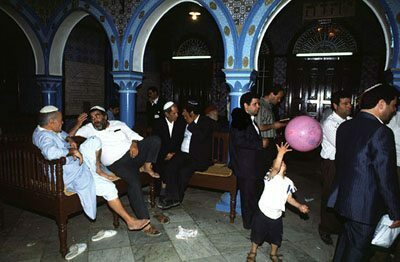 In the El Ghriba Synagogue, Djerba, Tunisia, 1995. Photo: Micha Bar-Am, Israel. Beit Hatfutsot, the Oster Visual Documentation Center. Interior view of the El Ghriba, Djerba, Tunisia, 1981. Photo: Jan Parik. Beit Hatfutsot, the Oster Visual Documentation Center. The El Ghriba synagogue of Djerba is the best known and famous of a number of synagogues with the same name located in other countries of North Africa, such as El Ghriba of Annaba, in eastern Algeria. The fame of the El Ghriba synagogue of Djerba is based on numerous traditions and beliefs that emphasize its antiquity and importance among the local Jews as well as those of the former Jewish communities of Tunisia and neighboring Libya. According to one tradition the beginnings of the synagogue are thought to be connected to the establishment of the earliest Jewish settlement on the Island of Djerba by a group of cohanim, priests from the Temple of Jerusalem, who supposedly settled on the island immediately after the destruction of the First Temple of Jerusalem by the Babylonians in 586 BCE. The tradition has it that these refugees brought with them a door and a stone from the altar of the destructed Temple. Even today visitors to the synagogue are shown a stone incorporated into one of the arches of the synagogue and which is alleged to be the original stone brought from Jerusalem. This first Jewish settlement by the group of cohanim was later called Harah Sghira. It has also been known as Dighet, a name which traditionally is explained of being a local Berber language variant of the Hebrew word delet, meaning “door”. There are additional traditions that explain the importance and the sanctity of the El Ghriba synagogue. According to one legend, the synagogue was erected in the first half of the 19th century on a place that previously was occupied by the cabin of a mysterious, strange (ghriba, in Arabic), modest, beautiful and solitary young girl that had never been accepted by the inhabitants of the island. Only when the girl died in a fire that consumed her hut but not her body, did the Jews of Djerba understood that she was a saint and consequently decided to establish a synagogue on the location of her dwelling. The legend has been attested in another variant according to which the girl was a Jewish refugee who had fled from the Land of Israel bringing with her a Torah scroll and a stone from the Temple of Jerusalem. The El Ghriba synagogue was erected on the spot where she died of exhaustion on reaching the Island of Djerba. 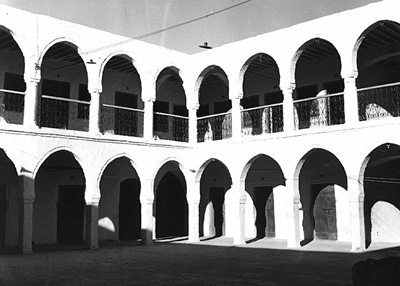 El Ghriba caravanserai in Houmt Souk, Djerba, Tunisia, 1962. Photo: Raymonmd Lange, Belgium. Beit Hatfutsot, the Oster Visual Documentation Center. 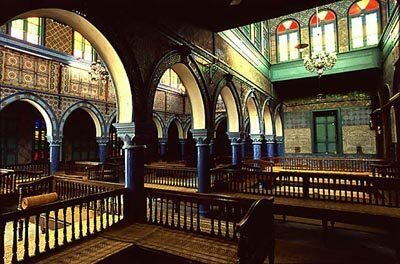 The El Ghriba synagogue is managed by an independent administrative committee that was set up at the end of the 19th century, when Djerba was under French colonial rule. Organizing the pilgrimage to El Ghriba, especially for Lag Ba’Omer (the 33rd day after Pesach) became the main concern of the committee. The large incomes from the pilgrimage and the rents from the lands and shops that belonged to the synagogue were spent on charity for the elderly Jewish inhabitants of Harah Srira as well as for sustaining the local regular synagogue goers and Torah scholars. The festivities of the main annual pilgrimage take place during Lag Ba’Omer: they start on 14 Iyar, when Jews commemorate the death day of Rabbi Meir Ba’al HaNess and continue through 18 Iyar, the remembrance day of Rabbi Shimon Bar Yochai, locally known as Rebbi Shem’un. The pilgrimage includes a visit to the synagogue, alms giving, prayers, and participation in one of the two popular processions that take place during the last two days of the annual festival. The procession includes visits to other praying houses in Harah Sghira. The participants carry a large pyramidal lamp (the menorah) mounted on three wheels. The chandelier is decorated with symbols representing the twelve tribes of Israel, the names of venerated rabbis of Tunisia, the names of the three Patriarchs and four Matriarchs, blessings in honor of Rabbi Meir Ba’al HaNess and Rabbi Shimon Bar Yochai, on top of which there is a Star of David (Magen David) with the inscription Shaddai (the name of the Divinity). The structure is crowned by the two tablets of the Law. The chandelier is decorated with various cloths, scarves of bright colors, and veils which resemble a bride, hence its other name arusa (“the betrothed”). The entire procession resembles a wedding ceremony and signifies the mystical union between the people of Israel and the Divinity. The participants sing songs in praise of Rebbi Shem’un, including one with the line: “Ya Rebbi Shem’un, uktashh tjina ou tna’hi lgalut min aalina!” (Oh, Rabbi Shimon, when you will come to deliver us from the exile!). In the evening the chandelier is introduced inside El Ghriba and candles are lit on all its five rows. 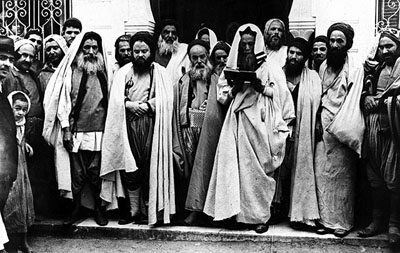 Local Jews from all villages in Djerba as well as pilgrims from abroad mingle inside the synagogue; this is also the only occasion when there is no separation between men and women. In the 1990’s and early 2000’s most pilgrims come from outside Tunisia. Following another local custom, women use to leave eggs with the name of a young unmarried girl inscribed on them on an arch that marks the place, where according to tradition the body of the marvelous girl (ghriba) was found. The egg, having been left to boil at the warm of the candle for the duration of the festival, is then returned to the unmarried girl, who after eating it, would be sure to find a bridegroom soon. Judging from the current state of the building it was probably erected sometime in the second half of the 19th century replacing earlier structures. The synagogue is mentioned in the early 16th century when it was destroyed during a Spanish military expedition to Djerba and reconstructed later in the same century. Like some other synagogues in Djerba, the El Ghriba is located in the proximity of an ancient Jewish cemetery. The El Ghriba has an inner courtyard surrounded by covered loggias build on arches and columns. The adjacent buildings served as accommodation for the pilgrims, the earlier one was erected at the end of the 19th century and it was followed by a second structure built in the early 1950’s. Unlike all other synagogues of Djerba, the El Ghriba does not have a separate open-air praying hall, but two covered halls. Judging from various architectural additions, it appears that the first room was initially an open courtyard that was roofed later to accommodate a larger number of people. This room is connected to the main praying hall by three arches. The central praying hall boasts two rows of arches that support an elevated clerestory with numerous windows. Originally there were twelve windows symbolizing, according to the local tradition, itself based on a Kabalistic instruction, the twelve tribes of Israel. However, following later renovations and additions to the building, there are now more than twelve windows inside El Ghriba. The later additions are especially evident on the northern side of the building where they brought about changes to the original symmetric plan of the building. The tevah is located beneath the clerestory at the west end of the praying hall, immediately at the entrance from the first room There are two rows of columns inside the main praying hall dividing it into three aisles; however the last column to the east on the southern row is missing and probably has never been built. Local tradition sees it as a remembrance sign for the destruction of the Temple of Jerusalem. Also it is stated that the building should never be finished, as nothing is perfect except for the Divinity. The seating benches are arranged around the tevah and by the walls. The inner walls are covered with glazed tiles featuring blue, white, and brown decorative eight sided patterns, unlike the exterior walls that are painted in white. A niche below the Holy Ark indicates the place where the body of the mysterious girl was found and it is known as Magrath Sibiya (“the cave of the girl”). Each Thursday the women of Harah Sghira clean and prepare the synagogue for the Shabbat and lighten the oil lamps, including the three main lamps that hung in front of the Holy Ark. One is dedicated to Rabbi Meir Ba’al HaNess, the second to Rabbi Shimon Bar Yochai, and the third one, called Sibiya, is dedicated to the el ghriba, the marvelous girl. During the last decades the Jewish community of Djerba shrank as many of its members emigrated to Israel, France, Canada, and other countries. The remaining Jewish inhabitants of Djerba became targets of occasional hostile behavior by the local Muslim population. On Simchat Torah festival of 1985, one of the policeman charged with the security of the El Ghriba synagogue opened fire at the congregation causing the death of three persons, including a child. On April 11, 2002, the El Ghriba synagogue was again targeted, this time by a suicide bomber who drove a gas truck to the proximity of the synagogue. The ensuing explosion resulted in the death of twenty one people, among them fourteen German tourists. Despite security concerns, the annual pilgrimage attracts large numbers of participants, many of them coming to Djerba from other countries.